It’s almost that time of year again–OH Fest. Recently, a new $24 student life fee was proposed to bring bigger acts to the event. On the surface, this does not seem like an unreasonable amount. However, the phrasing “new fee of $24” in an e-mail entitled “Student Life Fee Referendum” is misleading. We already pay a student life fee–there’s nothing new about it. We pay $1,550 each academic year in addition to our tuition; room rent; and dining fees, if applicable; to cover campus activities like concerts, as well as technology services, athletic facilities, transportation, and health center access. Still, you may think, what’s another $24? Well, it’s the principle. I would welcome an additional fee if it truly meant we would be getting bigger and better names for OH Fests yet to come; however, I am skeptical. This event takes place downtown and is open to the public. Therefore, the topic of whether the acts are considered family friendly is always a concern. A list of potential artists we could bring to OH Fest with this new fee was sent around as incentive to vote in support of it. The list included past performers such as A Boogie Wit Da Hoodie, which we could ironically afford on our old budget. This caused my confusion and further skepticism. Aside from that, the list includes some well-known acts I would love to see play at OH Fest. But there’s one problem—they aren’t all family-friendly. And, so, it begs the question: is my additional $24 really bringing the acts it’s supposed to? We’d have to define “family friendly.” We got A Boogie last year, who I would hesitate to say meets community standards, but then again his performance was censored. We have to take that into consideration. Maybe we will get these acts, but will we be enjoying them in their true form? This leads us to censorship and how it was applied to last year’s student opener Johnny 2 Phones. He violated his agreement with the college by swearing in his songs, and his performance was cut short. There was talk of not allowing student openers this year as a result of the events. To me, that is outrageous. This event is about the college student body – it is OH (Oneonta-Hartwick) Fest, after all. We should be supporting and empowering our student performers not holding them back because someone arbitrarily decided some words are more appalling than others, and that someone’s sensitive ears that chose to go wouldn’t be able to handle it. That leads to my next question: is OH Fest a place for children, anyway? 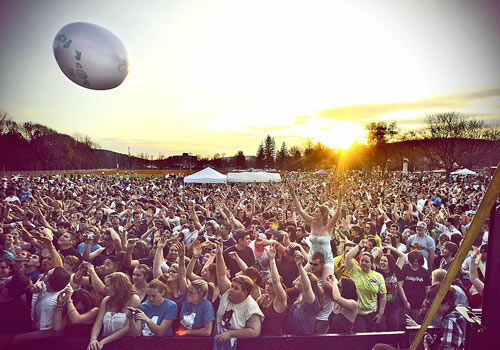 It is an outdoor concert that was created with the intention of bringing two rival colleges together. So, we must face facts –drinking and other substance use happens. Students start moshpits; there’s pushing, shoving, and sometimes even fights break out. It comes with the territory if you’ve ever been to a general admission concert. It is no place for a child, and I’m not sure why we’re trying to make it one. Throughout last year’s OH Fest, the event was constantly being interrupted because someone’s child went missing. Personally, I would prefer the event didn’t take place in town or wasn’t open to the public if it meant students could fully enjoy the experience and children’s safety isn’t being put at risk. I’m not sure if, logistically, we could hold the concert on the Hartwick or SUNY Oneonta campus, but, if so, I think it would solve some of our problems. If this isn’t feasible, we need to remember the acts are being funded by Hartwick and SUNY Oneonta. If non-students are going to be weighing in on and limiting our choices, then maybe they should be contributing to the act’s funding through an admissions fee. Perhaps that is where the additional costs should be coming from rather than our student fees. Now, I understand that some would like this event to bridge the gap between student and town members. And I truly believe a bridge is necessary and important so that we can maintain peace. There are so many negative stereotypes we hold about each other as students and town members that we need to get past together. But by using OH Fest, we are only creating divides and animosity which is not what we need as a community. In the end, we need to realize a college concert isn’t and shouldn’t have to be that bridge.